Whats a girl to do? Bullies, drugs and alcohol, and unrealistic images of women in the media top the list (80%, 75% and 74%, respectively) perceived by U.S. adults to be threats to girls under 18s positive self-image, according to an online national survey of more than 2,000 U.S. adults by Harris Interactive on behalf of The Girls Empowerment Network, also known as GENaustin, in October 2013. Alongside those familiar concerns, nearly seven-in-ten (69%) adults pointed to inappropriate use of technology such as social media and texting as damaging to a young girls self-image. Nearly half (45%) of adults say a positive role model is the biggest asset to a girls healthy and positive self-image. Topping the list of positive role models for girls are First Lady Michelle Obama (50%), Olympic gymnast Gabby Douglas (42%), Oprah Winfrey (41%) and Supreme Court Justice Sonia Sotomayor (36%). Other adults preferred business leaders and entrepreneurs as role models, including Facebook executive Sheryl Sandberg (16%), Yahoo! CEO Marissa Mayer (23%), and fashion entrepreneurs Mary Kate and Ashley Olsen (10%). The least popular choice was singer Miley Cyrus (2%), though four percent of adults ages 18-34 believe she is a positive role model for girls under 18. The survey, commissioned by GENaustin, which creates after-school programs and workshops for girls and parents, points to the importance of role models and social emotional skills, like having healthy friendships and setting goals. GENaustins upcoming We Are Girls conference on November 9, 2013, in Austin, Texas, provides a full-day of activities and workshops designed to support and guide girls as they navigate the unique pressures of girlhood. 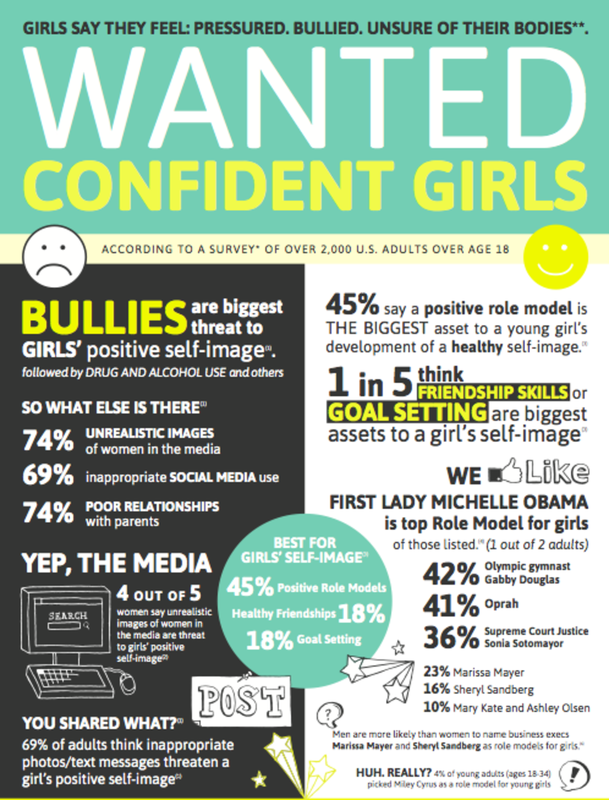 Women largely agree (74%) that unrealistic images of women in media can affect girls positive self-image. However, younger men and women (ages 18-44) are miles apart on this point. Nearly four out of five women (77%) in this age range agree that medias images of women are harmful to girls, compared to less than two-thirds of men (60%). GENaustins Cuba observes that there may be a disconnect between our societys concern with bullying and its solutions. Eighty percent of adults see bullies as a threat, yet only 18 percent selected friendship skills as the biggest asset for a girls self-image.  Parent relationships matter.Older women - those ages 55+ (81%) and ages 45-54 (78%) - are more likely than women ages 35-44 (64%) to say a girls poor relationship with her parents is more detrimental to her self-image.  Drug and alcohol use affects self-image, but saying no isnt the highest priority. The widest disagreement among women is the impact of drug and alcohol use, with 4 out of 5 women over age 45 (80%) agreeing its a threat, compared with 62% of women ages 35-44. Only eight percent of adults said saying no to drugs and alcohol is the biggest asset to developing a positive self-image, but 75% say it is a threat.